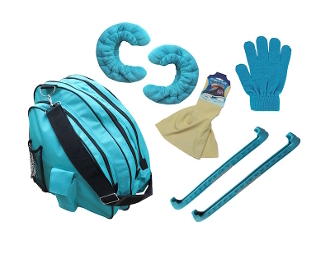 The Ice Skating Accessories Package is a Great Gift Idea for your skater! This package has all the accessories you need to get started or take up where you left off. Our accessories packages comes with a Wipe-n-Dry Chamois to wipe the water off your blades, a pair of terry soakers, a pair of solid blade guards, a pair of knit gloves and a deluxe skating bag to carry them all in. You won't be disappointed! Choose from red, blue, pink, purple, black, gray, teal, and berry. 1 Pair of knit gloves. 1 Pair of Solid Color Skate Guards. Trim to fit any skate blade. The gloves come in tot size or adult size. Tot size fits children ages 6 and under. Adult Size fits children ages 7 and up.